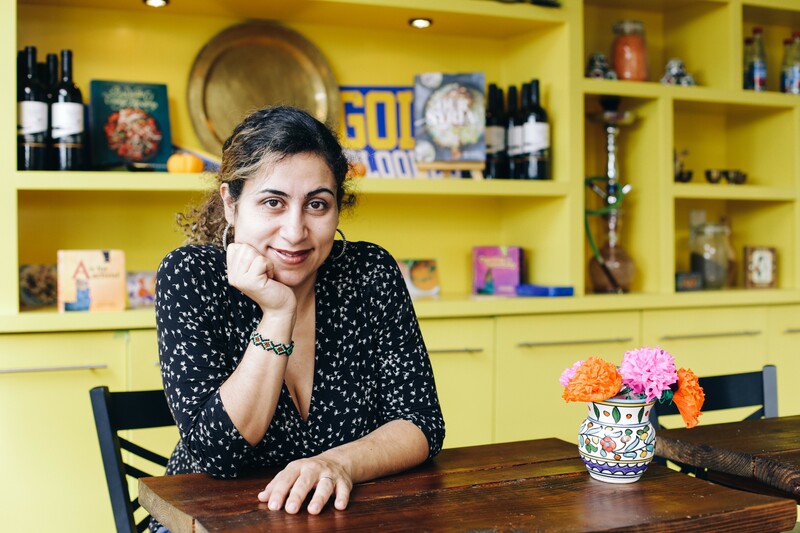 James Beard Best Chef semifinalist and La Cocina grad Reem Assil, who launched the Fruitvale bakery Reem’s last year, is opening her second Oakland restaurant. Located in Jack London Square and operated in partnership with Daniel Patterson’s Alta Group, Dyafa (44 Webster St.) will offer Arab fare inspired by Assil's Palestinian-Syrian heritage and her travels in that region that infects fine dining with a lively community atmosphere. The restaurant, located in the former Haven space, will open for lunch service tomorrow, with dinner to follow later this month. At lunch, Dyafa — whose name derives from the Arab word for hospitality — will offer shareable snacks, dips, grain bowls, and salads. Lunch will also include flatbread wraps featuring the signature bread from Reem’s, baked on the traditional convex griddle known as a saj. Dinner features heart-baked specialty breads alongside wajbat khafeefa (small bites) including kabees (pickles) and an Arab-style charcuterie plate with fresh-baked pita; as well as cold and warm mezze plates such as muttubal (charred eggplant with garlic, lemon, and tahini) and zidbiyat gambari (shrimp-tomato claypot stew) and larger-format dishes such as shakriah (braised lamb shank) and musakhan (sumac-spiced chicken confit). Weekend brunch at Dyafa will feature fare such as ful medames (fava bean and chickpea stew with poached egg) and um ali (sweet phyllo milk porridge) as well as shakshuka (tomato-poached eggs with peppers). Middle Eastern flavors and Reem’s collection of classic Arabic cookbooks inspired bar manager Aaron Paul's cocktail program. A concise wine and beer list will feature selections from California and Lebanon. Warm hues bringing to mind those of the Arab world animate the 105-seat restaurant, whose design elements include a walnut bar, indigo paneled partitions, lush greenery, and vibrant geometric floor tiles. An exposed woodframe ceiling reveals an intricate grapevine canopy and suspended bamboo light fixtures from noted New Zealand designer David Tunbridge. Dyafa, 44 Webster St., Oakland, 510-250-9491, Lunch: Tuesday-Friday, 11 a.m.-2 p.m.